Charlos Gounod wrote Funeral March of a Marionette (Marche funèbre d'une marionnette in its original French), in 1872. Originally, the work was going to be part of a "Suite burlesque", however, he dropped the idea when he concluded the first movement. 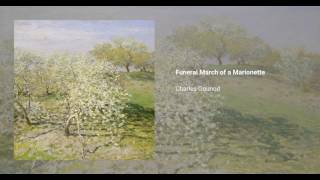 The Funeral March was orchestrated in 1879, and it later achieved popularity as the theme music for the TV program Alfred Hitchcock Presents, which aired from 1955 to 1965. The orchestration calls for 1 piccolo, flute, 2 oboes, 2 clarinets in A, 2 bassoons, 2 horns in D, 2 trumpets in A, 3 trombones, ophicleide, timpani, bass drum, triangle, and strings.